Just copy and paste the address from your browser's address bar. 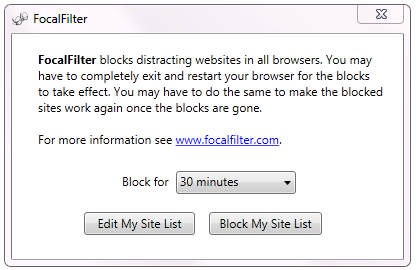 The list of blocked sites is saved for the next time you run FocalFilter. You can't reach FocalFilter's controls while it is blocking sites, and terminating it or uninstalling it before the time runs out will not remove the blocks. If FocalFilter is still installed, you can remove the blocks early by rebooting your computer. FocalFilter works on Windows 10, 8, 7, Vista, and XP. You can download it for free here (the latest version was released August 2015). To run FocalFilter, your PC must have Microsoft's .NET Framework version 4. If you don't already have it on your PC, our installer will let you know. You can install .NET here. If you are having trouble with FocalFilter, or you are using it on a tablet device, please read more about how to use FocalFilter on your version of Windows: Windows 10, 8, 7, or XP. Note: Some security or antivirus software may stop FocalFilter from working because it modifies your system settings. Please let us know if this happens. For example, if you have this problem with Kaspersky Anti-Virus, you can add FocalFilter to its list of trusted applications. If you have any problems with FocalFilter, the site-blocking tools Leechblock for Firefox and StayFocusd for Chrome should always work, because they are browser add-ons. And they have many extra features compared to FocalFilter. LeechBlock is harder than StayFocusd for a sophisticated computer user to sneak around while it is blocking sites. Cold Turkey for Windows blocks across all browsers like FocalFilter but has many extra features and also can block applications and games. If you have problems with FocalFilter, Cold Turkey may work for you. Note that Cold Turkey may prevent FocalFilter from working. 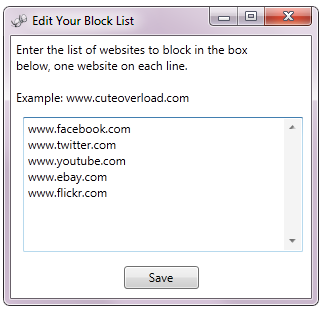 Freedom for Windows, Mac, iPhone and iPad blocks across all browsers like FocalFilter and has many extra features. If you have problems with FocalFilter, Freedom may work for you. SelfControl is a Mac tool with similar features to FocalFilter. FocalFilter is brought to you by Dee Gelbart and Shan Naziripour.